In the late 1970s I was a teenager practicing for a bass fishing tournament on Whitehall Reservoir in Hopkinton, MA. I was a kid who won enough money by fishing bass tournaments to buy gas for my old car and my newly-purchased bass boat. You could already tell my priorities by my choice of vehicles – an old car pulling my brand-spankin’ new bass boat! Eat, sleep, fish...that’s what I did. I won my first regional bass tournament the year before and had dreams of becoming a full-time bass pro, to my immigrant parents’ profound horror. They wanted a doctor but got a fisherman instead. Ironically Hopkinton, where I was fishing that day, is the starting point of the Boston Marathon, 26 miles from downtown Boston. Little did I know that this would be the start of my own personal marathon – the beginning of a long, hard road. That day on the reservoir, the bass were hiding under floating undercut islands. Inaccessible! Or were they? I thought about it, went home and melted some plastic worms, cut up a Coke can, glued it all together and mounted a jighead backwards on the contraption. That first lure was an "underwater airplane", hence the name, "Flying Lure". In retrospect, it looked a bit scary, but it actually swam under those floating islands. I never did catch anything on that very first “flying” lure, but it proved the concept -- I knew that this was something special. And then what did I do? I went and hid the lure in a box for a decade. Brilliant! I put the Flying Lure away for 10+ years and told no one about it, finished college and went into the emerging microcomputer software business like many people in the high-tech oriented city of Boston. It was an exciting time in the computer world. Steve Jobs and Steve Wozniak had started Apple Computer just a few years earlier. Among others, I met people like Bill Gates, founder of Microsoft and Dan Bricklin, the developer of VisiCalc, the first microcomputer spreadsheet software that propelled the Apple II computer to become the pioneer of microcomputers. All other microcomputers were based on Apple’s initial success. I also met Alan Kay, the head honcho of Xerox Palo Alto Research Center and the inventor of the now-famous Apple user interface and the computer mouse. I would meet Alan once again years later by chance in Hollywood. I ran into him in a TV studio while I was producing an infomercial and he was the Software Evangelist for Apple Computer. Alan reaffirmed my life choice to get out of computers and go into fishing instead. But those are different stories for another day. But I never completely forgot about the Flying Lure because I knew it was something special. All the while, I kept working in my parents' cellar late at night – taking my secret lure out of its box and working and improving on it. I would tease friends that I had a "secret lure", but never told them what it was. While running my own startup software business, I had little time for tournaments (although I did fish once in a while for a competitive "fix"). However, I really specialized in catching big bass from heavy cover -- lots of them. I became known for lunker catches on Cape Cod's monster bass lakes. Cape Cod, Massachusetts has a unique, almost magical combination of two factors that support the growth of extraordinarily large fish. I call it the “Cape Effect”. The “Cape Effect” is the unique combination of a micro-climate that keeps Cape Cod a few degrees warmer than the rest of New England in simultaneous combination with an over-abundant high-protein food source. Greater Cape Cod is choked with ocean-run herring which pile into freshwater streams and ponds to spawn. There are “herring runs” all across southeastern Massachusetts counties, which include Cape Cod. Local people go to the herring runs with nets and literally scoop up the swarms of migrating herring. Herring runs are reminiscent of the more familiar salmon runs or shad runs. That was my very first introduction to fishing with my grandparents. They were Russian and herring were like lobster to them – there were thousands of delicious herring in a shallow stream ready to be scooped up with a hand net. It was like heaven to them. Before I ever caught a bass, I was catching herring with my grandparents on Cape Cod. Herring runs have been happening since the Pilgrims landed in Plymouth in 1620 and probably millions of years earlier. Herring were so abundant in Massachusetts at that time the Wampanoag Indians taught the pilgrims to plant a herring at the base of each corn plant to fertilize it. Now that’s an abundant resource! Like the first Thanksgiving, that story is now a part of American folklore. Plymouth, Massachusetts, where the pilgrims landed at the end of their daring transatlantic voyage is the gateway to Cape Cod, Massachusetts. Huge fish of all species, especially warm water species like bass and pickerel grow on the Cape and its vicinity. I’ve also caught very large pickerel – up to 6 pounds -- on the Cape while trying to catch bass. Incidentally, Massachusetts has the #2 ranked state record of Chain Pickerel at 9 pounds 5 ounces. That’s just one ounce shy of the #1 state Chain Pickerel record of Georgia, which is also incidentally, the world record. Georgia also holds the world record largemouth bass title at 22-4. That longstanding world record, held since 1935, was recently tied at Lake Biwa, Japan in 2011. Georgia has the unique distinction of holding 2 world record titles – for bass as well as pickerel. One that’s perhaps the most famous record among world records, the other, not so much. Cape Cod is basically a big sand bar a few feet above sea level that sticks out about 100 miles into the Atlantic Ocean. It’s the “bay” part of Massachusetts, which is known as the bay state. Cape Cod is known for its unusually mild winters, unlike the rest of the northeast. Sometimes the lakes on Cape Cod never even freeze. Think about that statement, sometimes the lakes don’t freeze at all – in the northeast! That’s why President Kennedy could play golf on Cape Cod in the dead of winter! Of all the areas in the world that were available to them, the temperate climate and its proximity to the halls of power might be the main reason that the Kennedy family chose to live on Cape Cod in the first place. It’s not Florida, but it’s warmer than anything else so close to work. Massachusetts Bass Record-Top 12? Really? The Massachusetts largemouth bass state record is exceptionally large, an unbelievable 16 pounds and 8 ounces and was caught in southeastern MA. That’s nothing short of incredible for a northern state. The record books give the location of the record catch as Sampson’s Pond in Carver, MA but a persistent rumor among bass geeks is that the huge bass was actually caught in the Agawam River. Sampson’s Pond is close to the Agawam River in southeastern Massachusetts. The Agawam River meets the ocean at Wareham, MA at the base of Cape Cod and is a fertile river choked with ocean-run herring. Sampson’s Pond, although in the general area, is connected to nothing. That’s why this rumor of the record bass being caught in the Agawam River makes complete sense. I’d bet a nickel that bass was caught in the Agawam. Unfortunately we’ll never know for sure. Would you have guessed that lowly, cold, little Massachusetts has the #12 largemouth bass record in all the USA? That includes big bass factories like California, Florida,Texas and even world record-holder Georgia. Check it out for yourself if you don’t believe me. Most of you would probably guess that Massachusetts was in the bottom 12 of all bass state records, not the top 12 and I wouldn’t blame you. The bottom 12 would be a reasonable guess. However, the Massachusetts state record is actually on par with the state records of southern states like North and South Carolina! It’s only about a pound shy of states like Alabama, Arkansas and Arizona and it beats Tennessee by a pound. Did somebody say Massachusetts beats Tennessee, in the heart of bass country? Really? Not bad for a small northern state. In my best year of fishing, I caught a dozen bass over 6 pounds, 3 over 7 pounds, a couple over 8. And one was 9 ¼ pounds. I didn’t even keep pictures of the 6 pounders. They were too small and there were way too many of them! But I did keep pictures of the 7s, 8s and the 9. Pretty good for northern bass fishing, don’t you think? All the other New England bass state records average just 11 pounds 15 ounces – not even 12 pounds! The Massachusetts record beats the others in New England by 4.56 pounds. That’s a staggering 38%, nearly 1 ½ times larger than nearby states. The obvious question is, “Why the disparity?”. The main reason for the huge difference is that Cape Cod is the last piece of land in North America that the warm water of the Atlantic Gulf Stream actually touches before it goes out into the North Atlantic Ocean. Not only is the ocean itself a huge heater during the winter, but the ocean’s warming effect is enhanced by the Gulf Stream, a plume of warm water that flows up thousands of miles from the south. So, the fish growing season on Cape Cod is longer than all the areas surrounding it, which yields above-average sized fish. Because of the warm water of the Gulf Stream, sometimes the ice never forms on the lakes at all. It’s probably why Cape Cod and the islands also excel as a saltwater fishery and a beach haven featuring some of the world’s top warm water beaches. And there I was, right in the middle of it all. Southern California in the Northeast? As if a warm winter climate wasn’t enough, many Cape Cod ponds have a high-protein source of food that swims in from the ocean up freshwater streams, right into the lakes. That food source is millions of ocean-run alewife (herring) 2 to 12 inches long. In my opinion, this combination of factors, a relatively warm climate coupled with a high-protein food source, rivals southern California lakes with their high-protein rainbow trout as a food source coupled with a warm California climate for big bass. Incidentally, California’s lakes are also crystal clear just like the Cape, so fishing techniques are similar. The only difference is that California has larger Florida-strain largemouth in deeper water. Cape Cod has smaller northern strain bass in shallower water. I firmly believe that the USA’s best northern-strain largemouth bass fishing is found right in the heart of Cape Cod, MA. Who knew Cape Cod was the epicenter of anything but stripers, beaches and bikinis? I challenge anyone to prove me wrong. Hmmm. I wonder if Florida bass could actually live on Cape Cod. Maybe I’ll call filmmaker and big bass expert Glen Lau. Bet he’d know. Huge freshwater Cape Cod fish always have been and still are my greatest passion. Most people who go to “the Cape” fish saltwater, not freshwater, which is just fine with me. They’re distracted by world-class stripers, bluefish and big-eye tuna. This is wonderful since it keeps the fishing pressure off my clear freshwater ponds. Because the water is crystal-clear, fish tend to hide in and around trees, docks, weeds and overhangs. And that’s where I fish the Flying Lure with unbelievable results. So, "extreme close-up fishing" was born in the mid-1980s, less than a decade after “flipping” was popularized by Dee Thomas in the late 1970s. The “ECU” technique is exemplified in the Flying Lure concept and now in the RotoTail. I didn't believe in just finding fish, I used to hunt them down in their hideouts. I was really crazy! I went right in after the fish. Sometimes I even fell into the water wrestling lunkers out of heavy cover. 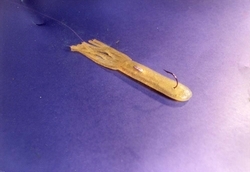 The Flying Lure was a tool that enabled this type of extreme fishing that would prove deadly all around the world. I believed that my lure which was being perfected at that time was such a world-beater, compared to all other lures available, that it was my duty to bring it to the world. By now, it was the late 1980s. Whether I succeeded or failed, the “lure project” had to be given a shot. When I quit the computer business, my friends and family thought I had gone completely crazy -- throwing my career away! Fortunately, time proved them all wrong. Even at that time, I knew that I could always go back and get an honest job, but this crazy lure was my dream! Using personal savings and the help of my family, the Flying Lure was perfected and professionally manufactured and packaged. But the world did not beat a path to my door. People loved the lure once they saw it work. People from all walks of life caught fish and became loyal supporters. Bassmaster Classic Winner Guido Hibdon and his son, Dion Hibdon who would also go on to win the Classic, loved the Flying Lure and began promoting it. Don Meissner, the Host of Public Television's "Rod & Reel Streamside" TV show discovered the lure after meeting me by chance at a trade show. Don began using the Flying Lure on his TV program with unparalleled success. He started catching amazing fish of all species, TV show after TV show on the Flying Lure! We soon became fast friends. But, the lure needed even more exposure to reach a critical mass of acceptance. The Flying Lure needed to be demonstrated to more individuals. Don and I once actually demonstrated the lure at a consumer fishing show in a 5-gallon cooler half-filled with water. Once folks saw it, they got the idea -- even in that cooler. People needed to see it work. People needed to be taught how to use the Flying Lure. Sitting on a store shelf, it looked like any other lure. That was the rub. It had to be demonstrated. This was going to be a long, hard road. In some ways, I still look upon those hard early days with blissful nostalgia. It was lots of work, lots of driving, meeting anglers and product demonstrations. Exciting when you’re young and have energy to burn! The Flying Lure is extremely effective once a person sees and “gets” it. But there are 2 obstacles to “getting it”. First, you have to see the lure actually swim away in the water. That’s the “Aha! moment” that opens people’s eyes. Second, to use the Flying Lure correctly, you have to give it semi-slack line, by following the lure’s motion down with your rod tip, so the lure can swim away unimpeded but so you can still feel fish strikes. It’s very similar to fishing a plastic worm. It’s a delicate balance and it’s the biggest key to properly fishing the lure. You can just cast it out and reel it in and catch a few fish, but to really use it to its fullest fish-catching potential, you have to master fishing with semi-slack line. My single greatest frustration even after all these years is that some folks still don’t really understand how to use the Flying Lure. They don’t give it slack line properly -- and then they blame the lure or the infomercial. An opportunity to make a 30-minute infomercial presented itself for the first time in the late 1980s, but I turned it down flat. A TV marketer had seen the lure in a small magazine article and thought it would be a great subject for a long-form infomercial. But, I had a negative opinion of the infomercials of that era that sold mostly baldness cures, ginsu knives and incredible woks. Rightly or wrongly, the negative residue of the infomercial label still tars excellent products with the black mark of “TV-promoted item”. Being a serious fisherman I didn't want any part of that. I put my head down and kept marketing my lure the traditional way. A year later, the Flying Lure was gaining a loyal following, but we were reaching just enough people to keep us in business, but perpetually broke. How could we reach more people? That was the question. I kept thinking about infomercials because they just made so much sense to reach the masses! But an infomercial had never been done before about just one fishing lure. At consumer shows, we could demonstrate the lure live in a Hawg Trough. With live fish destroying it on just about every cast, people saw and “got” the lure. It was happening right in front of them. They couldn’t deny it. Fish attacked the Flying Lure while other lures fished by nationally-known pros, failed to draw a strike in the same tank with the same group of fish -- just moments earlier. This actually happened time after time, show after show. The fish went wild for the Flying Lure! People saw how much the fish loved it and got the concept. They became loyal Flying Lure users. My friend, Ray Lentine, commented after a successful live show in New Orleans, that if we could show the Flying Lure in action to a million people, as we had just done with a few dozen folks earlier that day, we could sell millions of lures, not just dozens. That incredible original videotape footage is posted in the VIDEOS section of AlexLangerFishing.com. I couldn't sleep that night. Of course! You have to go to the people where they live, just like the Flying Lure goes to the fish, where they live. Same concept! I looked up the name of the infomercial marketer who had called me a year earlier. The next morning, that fateful call was made. It was to Jim Caldwell, an up and coming producer and successful TV Host of shows such as HBO Entertainment News and PM Magazine in New York City (preceding Matt Lauer of Today Show fame). The rest, as they say, was history. An infomercial was the last option I considered, but ironically, it was the very best way for a "little guy" with no connections in the fishing business to reach the whole wide world. Buying TV time was very expensive. The reason infomercials were the perfect route for a small guy is that after the video was produced – if successful, and that’s a big if (infomercials had a 70% failure rate then) – the infomercial paid for the TV ad time all by itself without any further infusion of money. Infomercials sell product directly on TV to the consumer and are self-funding by definition. Consumers call the 800 number and send money. That money lets you keep running an infomercial on TV and make even more TV sales and promote retail sales until direct TV sales dry up. Fortunately, in the case of the Flying Lure, this cycle would last many years. Traditional advertising was expensive. The big fishing tackle companies had long-standing relationships with stores and distributors -- a tough nut to crack. Distributors and catalogs wanted to see serious advertising/promotional budgets, which we didn’t have. Many magazines demanded advertising dollars before they gave a new lure any exposure. Commercial TV fishing shows wouldn't even consider your lure if you did not advertise with them. The doors were closed to a small new lure inventor who urgently needed to break into the business. The deck was stacked -- especially against industry outsiders like me with little or no money to spend. One sales manager of a major outdoor magazine even went so far as to mock me. During a conversation I began to speak about our company stating, “We’re not big, but…”. He sarcastically finished my sentence for me by saying, “We’re not big, but we’re little”. He slapped me down. With a few decades of perspective, I now understand his frustration. He probably just spoke to dozens of people like me, all of whom had the same story. Was he wasting his time with me? He wasn’t sure -- and that was as clear to me, as it was devastating at the time. We had no money. We were a small, insignificant outsider trying to crash the party just like a thousand others and all the doors were being slammed in our face at the same time. We needed a completely new way to reach our goal...a road less traveled, or never before traveled. QUESTION: How Can A Little Guy Kick the Door Down? In the spring of 1991, I met for the first time with Jim Caldwell at the Turner Fisheries Restaurant in downtown Boston. During that first meeting, Caldwell sold me on the logic of presenting my lure and telling our story in a TV infomercial directly to the public. If the show succeeded, we could bypass all the doors that were closed -- and tell our story right to the customer. I said, "OK, Let's make an infomercial -- but OUR way". Real fishing shots, real user stories, real shots from the Hawg Trough demo tank, real-life fishing on TV and not some goofy contrived script with a cheering audience. Damn the torpedoes! Let's put it all on TV. Was this the world's first reality TV fishing show? Jim and I then went to National Media Corp, which was emerging as the world's largest infomercial company at the time. The principals of National Media took one look at the Flying Lure and the first home-made video my dad and I ever shot of the lure in action and loved the idea! They funded the TV production of the infomercial on the spot. That was our first major positive bit of feedback. Somebody believed enough in the lure – and in us -- to give us our first real chunk of seed money. After months of intense video production in the fall of 1991, the original Flying Lure TV infomercial was completed and tested on national TV December 21, 1991. Everyone was on pins and needles. The results trickled in. Was the show a success or a failure? The deciding phone call came a few days later. Kevin Harrington, the President of National Media Corporation was on the line. Kevin is one of the founders of the TV infomercial industry and since co-founding National Media, has gone on to even greater successes such as starting Home Shopping Network’s infomercial division, as a “shark” panelist on ABC’s popular reality TV show Shark Tank and his own latest venture, TVGoods, Inc. Kevin produced one of the first successful infomercials in the 1980s as soon as long-form commercials were allowed by the US government. NEWS FLASH: Little Guy Finally Kicks Door Down -- It’s a Hit! Since the 1980s, Kevin Harrington has financed over 500 product launches resulting in sales of over $4 billion. The Flying Lure unbelievably had now become one of Kevin’s big winners! My wildest dreams had finally come true. Someone once said - You can't stop a good idea whose time has come. And so it was with the Flying Lure. Graphic underwater footage of the lure in action, genuine testimonials, numerous "live-strikes" on-camera, a variety of species, a terrific offer, Jim Caldwell hosting... they all contributed to the unprecedented success of the Flying Lure. We went on to produce many domestic and international infomercials since that first 1991 show. Sorry, Cindy. It would have been an honor to lose to you! •	Disney approaches me to write a book, and publishes "Flying Lure Fishing"
•	A popular Dutch rockabilly band actually named itself, "The Flying Lures"
•	I’m regularly asked to speak at national forums for inventors/entrepreneurs and at outdoor conventions.